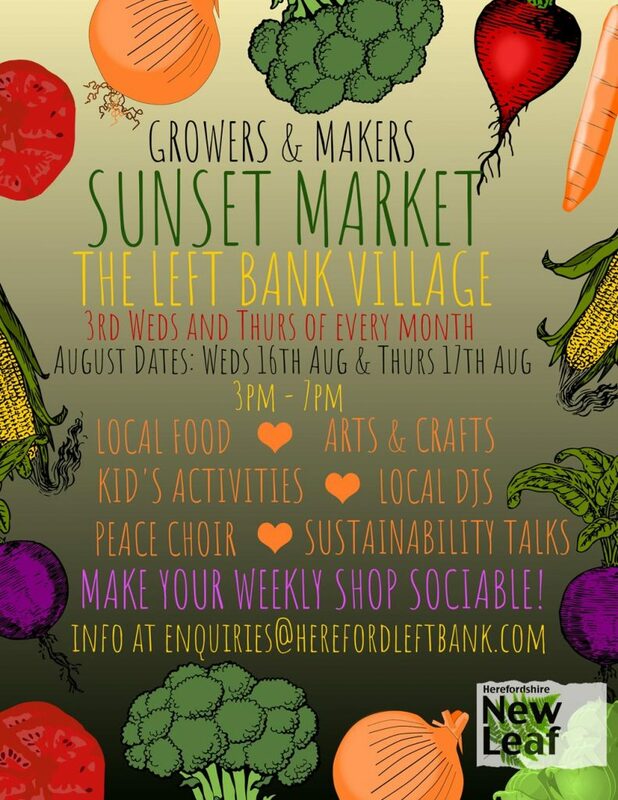 This summer in collaboration with our wonderful friends at Left Bank Village, we are launching Herefordshire’s first early evening ‘Growers & Makers’ markets. New Leaf hope to add a second Sunset Market at Queenswood over the coming months, offering another opportunity for a ‘local stop & shop’ – at the Sunset Market rather than the Super Market – on the route home from school and work. This month’s market in the gorgeous riverside courtyard at De Koffie Pot will include delicious local fresh produce and preserves, alongside local ales, cider and craft. On Wednesday evening at 6pm there will also be a visit from the Turnastone Peace Choir, and at 7.30pm upstairs in De Koffie Pot the market will be followed by a discussion about ‘How People Transform’ hosted by the Herefordshire Green Network. This is something truly wonderful and unique created by locals for locals! Organisers hope that the markets will become a regular feature of Hereford city living. The addition of talks and speakers means that this is an opportunity to feed your minds as well as your bodies on tasty locally goodness. The first market days are Wednesday 16th and Thursday 17th of August running from 3pm to 7pm. If you would like to take part as a vendor at one of the Left Bank regular Sunset Markets please contact enquiries@herefordleftbank.com marked FAO Sophie: Local Market.